Clay MIL-SPEC Desiccant Packs - Interteck Packaging, Inc.
Our Unit Bag line offers drying applications for all size packaging. These Unit Bags meet or exceed MIL Spec 3464, Type I & II. A “”unit”” refers to a Military Specification for packaging. The term “unit” is a quantity of desiccant, which will absorb a set percentage of its weight at certain levels of humidity. For convenience, one “unit” is approximately equal to one ounce. Wide Variety of Applications: Rolled Steel, computers, aerospace, automobile parts, military equipment, crates, etc. 1/6 unit clay desiccant bags offer a simple and effective way to dry and protect a 240 cubic inch space. Our 1/3 unit clay desiccant bags offer a simple and effective way to dry and protect a 476 cubic inch space. Our 1/2 unit clay desiccant bags offer a simple and effective way to dry and protect a 1250 cubic inch space. Our 1 unit clay desiccant bags offer a simple and effective way to dry and protect a 2500 cubic inch space. 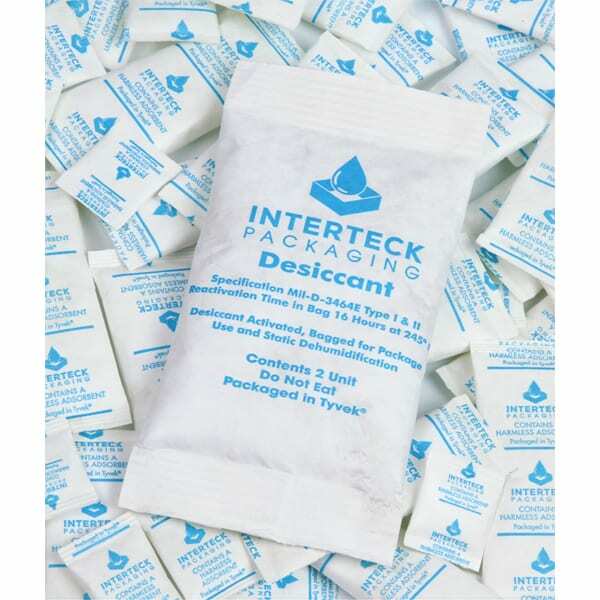 Our 16 unit clay desiccant bags offer a simple and effective way to dry and protect a 22850 cubic inch space. 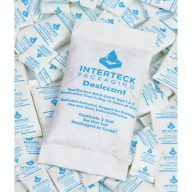 Our clay/tyvek packs are food and pharmaceutical safe and made in the USA.